Your Most Reliable Source For Quality Roof Cleaning, Repair, Maintenance, and Roof Restoration, specializing in washing all types of Roofs, Decks, Patios, and Driveways. Steep roofs are no problem for our experienced personnel. Experts in shake roof repair, restoration, and maintenance. No matter what your needs are, cedar shake, composition, and all other types of roofing materials, we can supply what you require. Our business is based in Woodinville, Washington, United States of America, and serves the greater Seattle area including North King County and Snohomish County. Our mission is to perform QUALITY work using the FINEST products, equipment, and personnel available which will guarantee a satisfied customer. Specializing in All Types of Pressure Washing and Roof Care Since 1988. We use only the best personnel, equipment, materials and technology available today. 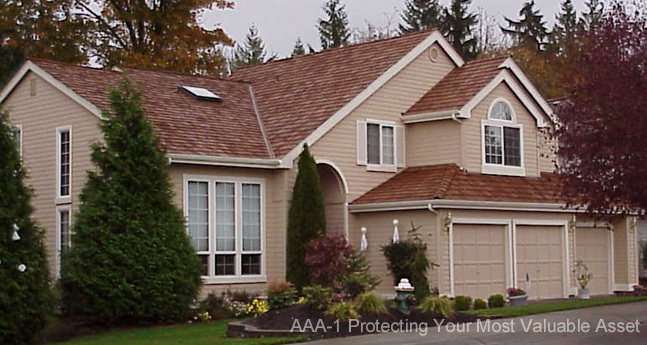 AAA-1 offers inspection and a Five Year Certification (call office for details) after cleaning and treatment which is also transferable to one additional buyer in a five year period. Our reputation is based on trust and workmanship. Let Our Experienced People Check Your Roof Before You Replace It! Most roofs can be saved before you go to the great expense of replacement. There are no secrets with us - we tell you up front what is needed! If you definitely need a new roof, check out the information on the Professional Roofing Service page. Contact Karen, our friendly office manager for a free estimate today. We will have an estimate for you within 48 hours of your request and provide the necessary service within seven days or less.